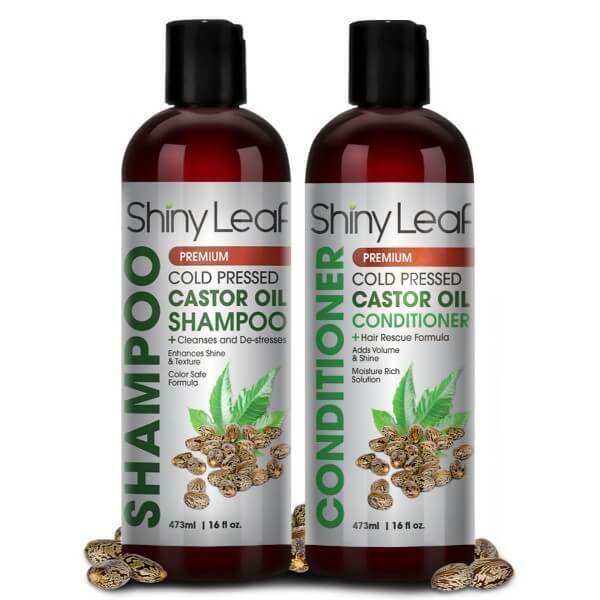 Keep hair care stress-free with Shiny Leaf Castor Oil Shampoo and Conditioner Set. This duo is one of the best hair care products that can improve hair to make it look lustrous and healthy. The formula for this set of hair products contains a rich amount of ricinoleic acid from castor oil. The products are also rich in other ingredients that nurture hair from scalp to tips. Improve dull and dry hair to give it a lustrous appearance with a nourishing cleanser. Shiny Leaf Castor Oil Shampoo cleanses hair gently without getting rid of the necessary moisture. 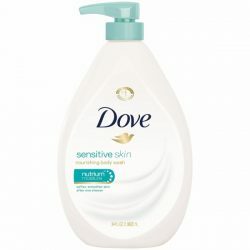 This keeps hair soft and manageable all throughout the day. It transforms hair to give it a full-bodied shiny look. 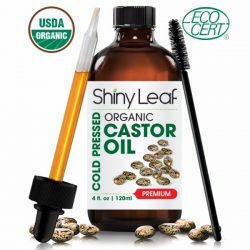 With the castor oil in its formula, it prevents scalp conditions from happening. Avoid flat and dull hair by providing moisture where hair needs it most. Follow up with the castor oil conditioner for added volume and shine. It makes hair easy to handle and style. 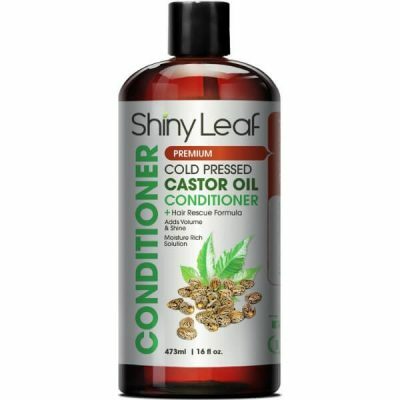 Shiny Leaf castor oil conditioner is rich in nourishing ingredients that promote healthy hair growth. It smooths out frizz and flyaways that make styling easy. 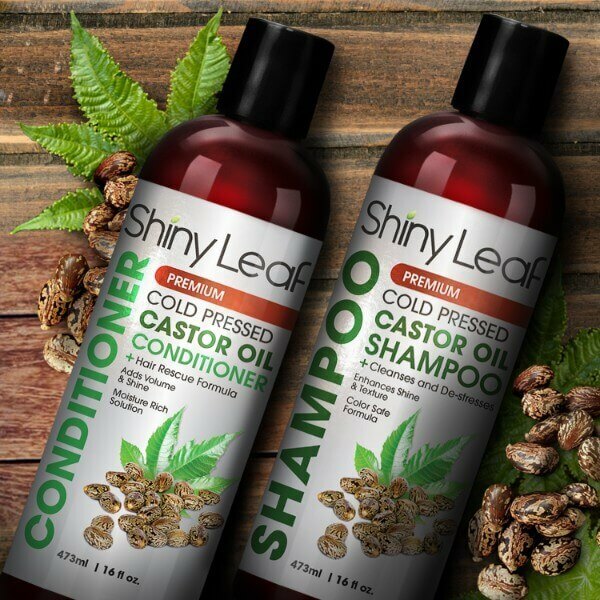 The shampoo and conditioner show the great effects of castor oil for hair. 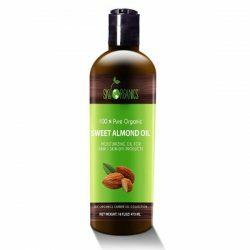 It delivers essential fatty acids that moisturize the strands and keep hair tangle-free. The ricinoleic acid stimulates scalp to grow healthy and resilient strands. 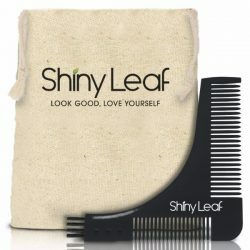 Shiny Leaf designed the products to provide a solution for thinning and falling hair. This set of hair products has a soothing and clean scent. It keeps hair and scalp smelling fresh all day long. Avoid frizziness and tangles with this set of hair products. They are safe and gentle for all hair types including color and chemical-treated hair. Use Shiny Leaf Castor Oil Shampoo and Conditioner Set to reduce hair loss. This pair improves scalp and hair care to keep tresses lustrous and voluminous. Get thick and soft hair that shines beautifully! Shiny Leaf Castor Oil Conditioner contains keratin amino acids and other natural extracts. Improves hair health to prevent thinning and falling hair. Created with a hair rescue formula that keeps hair from drying and dullness. 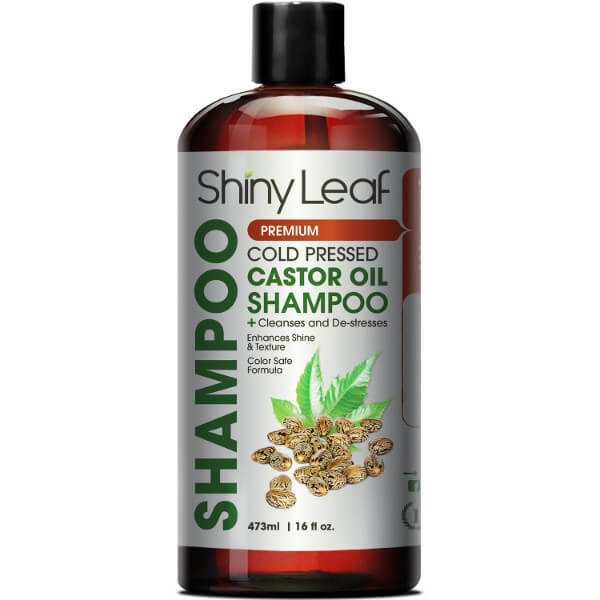 Shiny Leaf Castor Oil Shampoo cleanses hair gently without removing necessary moisture. Provides nourishment that strengthens hair. Gives hair extra volume and shine. Improves hair texture for a silky smooth feel. Wet hair from scalp to tips. Use enough shampoo to cover hair fully. Create lather with hands and massage on scalp and hair. Leave on for 2-3 minutes to let the nutrients absorb into the scalp and strands. Rinse with warm water. To use the conditioner, wring out excess water from hair. Use enough conditioner to cover hair and scalp. Apply on scalp and massage the conditioner to hair. Leave on for 2-3 minutes. Rinse with warm water. Make sure not to leave any soapy residue.